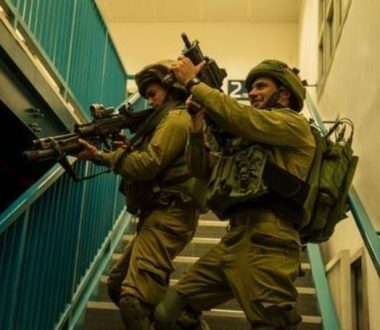 Updated: The Palestinian Prisoners Society (PPS) has reported that Israeli soldiers abducted, overnight and at dawn Monday, twelve Palestinians, after the soldiers invaded and violently searched dozens of homes across the occupied West Bank. The PPS said the soldiers interrogated many Palestinians, while inspecting their ID cards and searching their homes, before abducting twelve. Mohammad Wael Zakarna, Qabatia – Jenin. Samah Ala’ Zakarna, Qabatia – Jenin. Mahmoud Mohannad Ya’acba, Kafr Ra’ey – Jenin. Ala’ Nabil Abu Dayya, Hebron. Nidal Thalji Ya’coub, 20, Beit Rima – Ramallah. Sho’eib Mustafa Zahran, Deir Abu Mashal – Ramallah. Mohammad Mousa Abu Mfarreh, Teqoua’ – Bethlehem. Mohammad Mousa Odah, Silwan – Jerusalem. Furthermore, the soldiers invaded Khirbit Homsa village, in the West Bank’s Northern Plains, and abducted Ahmad Yousef Abu Awwad, 26, after assaulting him, causing various cuts and bruises. On Sunday at night, the soldiers invaded Khirbit Ibzeeq area, east of Tubas in northeastern West Bank, and handed orders to sixteen Bedouin families, (around 80 persons, including children), instructing them to leave their homes on Monday, from 7 in the morning until six in the evening, so that the army can conduct live fire training. The Palestinian Prisoners Society (PPS) has reported that Israeli soldiers abducted, on Monday at dawn, eight Palestinians from their homes, in several parts of the occupied West Bank. The Jenin office of the PPS, in northern West Bank, said dozens of soldiers invaded Qabatia town, south of the city, and violently searched them, before abducting two young men. It identified the abducted Palestinians as Mohammad Wael Zakarna and Samer Ala Zakarna. The soldiers also fired gas bombs and concussion grenades at many youngsters, who protesters and hurled stones at the invading army jeeps. In addition, the soldiers invaded and searched several homes in the Old City of Nablus, in northern West Bank, and abducted Nasser Halawa and Adham Khashana. The Ramallah office of the PPS, in central West Bank, said several army jeeps invaded Beit Rima town, northwest of the city, searched homes and abducted a former political prisoner, identified as Nidal Thalji Rimawi, 29. The soldiers also fired gas bombs, concussion grenades and rubber-coated steel bullets at local protesters, and closed roads leading to nearby villages for several hours. In related news, the soldiers invaded Doura town, southwest of the southern West Bank city of Hebron, and abducted Ahmad al-Masri and Mousa Ribhi al-Hroub, from their homes. The army also invaded the nearby towns of Ethna and Yatta, and installed roadblocks on roads leading to Sa’ir and Halhoul towns, in addition to the southern entrance of Hebron city, before stopping and searching dozens of cars, and interrogated many Palestinians while inspecting their ID cards. In occupied Jerusalem, the soldiers invaded Silwan town, south of the Al-Aqsa Mosque, and abducted a young man, identified as Mohammad Mousa Odeh. It is worth mentioning that Odeh is a former political prisoner, who was frequently abducted and imprisoned by Israel, along with other family members.